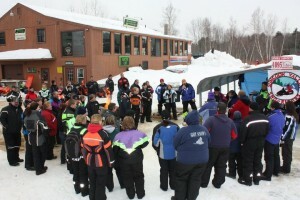 Interested in joining the Suncook Valley Sno Riders club? Our club maintains the local trails in Pittsfield and Barnstead NH. Becoming a member of our club will help us improve and maintain our trail system. The Suncook Valley Sno Riders also holds many fundraisers throughout the entire year to help fund our club needs for building bridges, fuel, and equipment maintenance and repairs. Your membership dues help maintain the trails you ride on! Even when the weather isn't favorable for riding you should still make a point to join the club that maintains the trails where you ride. Your membership gives you voting power at our meetings and you also get the monthly newsletter which keeps you up to date on any major developments affecting the trails and equipment. Membership costs are $25 for an individual or family membership. If you join online there is a $3.50 fee for S+H. All added donations go directly to the Suncook Valley Sno-Riders club to help maintain the trail system and equipment. You will receive your membership card in about one week. Join Online or at The Locations Below! 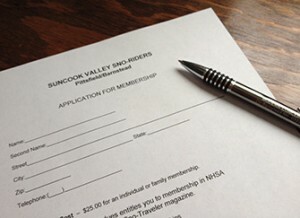 $10.00 of your membership dues entitles you to a membership in NHSA and a one-year subscription to Sno-Traveler magazine. If you belong to another club, then you have already paid the $10.00 and you will want to use the US Mail option below and follow the instructions. Note: Please be informed of the new F&G policy that requires you to have a membership voucher number before the registration discount be applied or pay the additional nonmember charge. Would you Like To Receive Newsletters and Sno-Traveler Magazine? $3.50 is added to online memberships for postage and handling. We will email your registration number so you can register your sleds, but please understand we process memberships manually so this can sometimes take a little time. We do process memberships as fast as humanly possible. Joining through US Mail is easy! Click Here to open or download the membership application. Once you have the application open on your computer screen, click print or on print icon. Carefully fill out the application. Making sure you have filled in every field clearly. Once the application is completely filled out just mail it to the address on the form. You should expect your membership cards within 7 days.